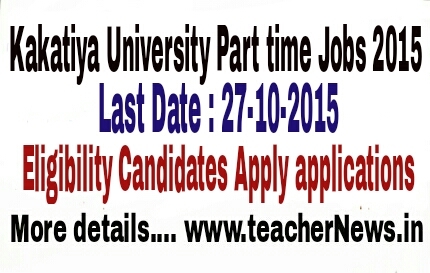 Kakatiya University Applications are invited from the eligible candidates for the temporary teaching positions for University Engineering Colleges, Kakatiya University on Contract/Part-time / hourly payment basis . 1) Rules of Reservation shall be made applicable as per the prevailing rules. 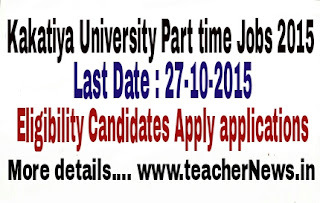 2) Retired faculty may also apply. 3) Date of interview : 05/11/2015 at 10.00 a.m.
4) They should be present one hour before the scheduled time of interview. 6) The filled in applications must be uploaded to the mail Id cpuceku@gmail.com #enclosures need not be uploaded along with application. 7) The filled-in applications with passport size photograph affixed on the application-form must be uploaded on or before 27/10/2015 by 5.00 pm. 8) Applications uploaded in any format other than the prescribed one and beyond the date/time specified will summarily be rejected without any correspondence thereof. 9) The Contract/Part-time assignment is purely on temporary basis and their services are liable to be terminated at the end of the semester/academic year or even before if the performance is not satisfactory. 10) Terms of the Contract Agreement : The candidates appointed shall execute an agreement on Non Judicial stamp paper of Rs.100/- with two witnesses and furnish same at the time of reporting to duty agreeing the terms and conditions of the contract. 11) The Candidates have to produce two pass port size photos along with two sets of attested photo copies of their certificates at the time of interview i.e. on 05/11/2015. Venue: Seminar Hall, University College of Engineering for Women, Kakatiya University Campus Warangal. e) Selection will be based on academic background, interview and demonstration. f) Short-listed candidates will be called for interview in 1:3 ratio. 13) Furnish correct mobile number/E-mail ID and communication address. No further correspondence shall be entertained if information is found incorrect. 15) The University reserves the right to cancel the employment notification in full or partial without any reasons thereof.